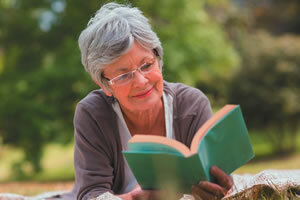 Here's another reason to keep straining your brain as you age: a study published June 23, 2014, in JAMA Neurology has once again confirmed the "use it or lose it" theory, which holds that staying mentally active by reading books, participating in social activities, and doing computer activities at least three times per week keeps the aging brain sharp. "If you use your brain, it will respond. Anything you try to figure out—whether it's what the stock market is doing, if it's going to rain tomorrow, or what to plant in your garden—will sharpen your ability to remember facts and reason and make decisions. Just keep intellectually active," says Dr. David Caplan, a Harvard Medical School professor of neurology. The study also split apart the effect of education and occupation earlier in life from mental activity later in life. The more mental challenge a person had from earlier education and work, the less "bump" he or she got from intellectual activity later. But that same lifetime intellectual enrichment from higher education and more complex jobs was associated with a delay of almost nine years in the onset of cognitive problems among people who carried the APOE4 gene, a risk factor for Alzheimer's disease.